Materials: vertical grain doug fir, baltic birch plywood, acrylic shoji panels, copper paint, and ML Campbell’s Magnamax precat lacquer. Acrylic shoji material sourced from Shoji Designs Inc.
Hardware & Servicing The body (I call this the lantern) contains 2 LED bulbs, one at the top and bottom to fill the body with light. The downlight in the bottom is a halogen pendant light straight off the shelf at Lowes Hardware. 2 of the side panels are removable to do the wiring hook-up and maintenance such as changing bulbs. The LED bulb life rating will keep this from happening very often as they have a life span rating of 23 years. The Story: This prairie chandelier was constructed for a fine woodworking exhibition that I was invited to participate in at the Museum of the Rockies in Bozeman, MT. The show runs 1 Nov 2012 thru 27 Jan 2013. That is provided the Mayan doomsday prophecy doesn’t destroy us all, but at least I can cross showing in a museum exhibition off the bucket list. The curator requested the prairie chandelier to be built as he had never seen anything like it, and he knew that none of the other craftsmen would be building them. 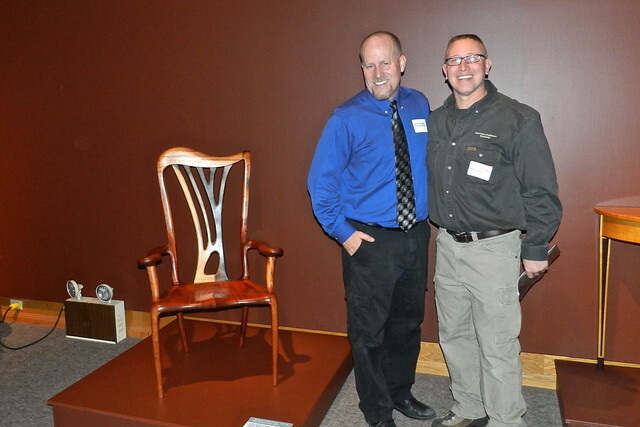 The curator did a great job of diversifying the fine woodworking exhibition among the 25 craftsmen showing. I have built this chandelier design before, back in 2007 for the Cooper House. The design is a Frank Lloyd Wright, prairie school inspired design. The Cooper House is a contemporary version prairie design residence that I built with my brother, and the architecture of the house provided a good bit of direction for the design. It might be hard to believe that the basic geometric form for the chandelier actually came from the stairwell tower of a parking garage that I saw in Ohio. 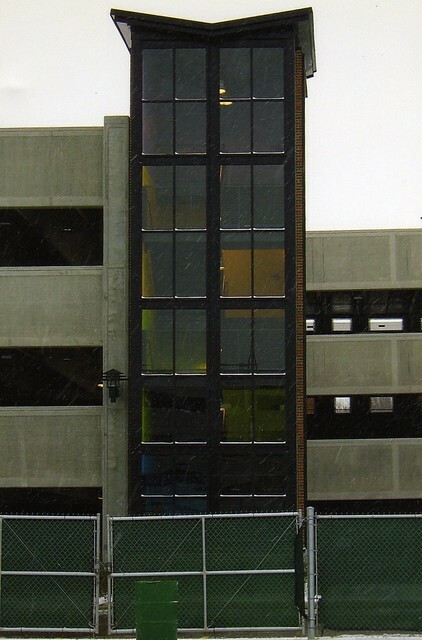 That is, until you see this picture of the stairwell tower. Here are some of the early models for exploring the design. This version of the prairie chandelier is taller than the originals. I felt that I needed to lengthen the overall proportions to tune them up a little bit. The original was good, I felt this was better. I used vertical grain doug fir due to it’s very lineal grain pattern. This project offers a great opportunity to interpret this wood. Another great benefit of vertical grain doug fir is that it gets darker with age so it will not fade. My vision of the chandelier is actually of the darker color that the fir will reach. Being freshly constructed, it is lighter than what I wanted but the color I envision will come to it even in the first year. I realized that I desperately needed help to get the chandelier finished so I called on a good friend, Mike Pasini and he bailed me out. Mike also helped me construct the bookcase for charity earlier this year. The prairie chandelier is deceiving. 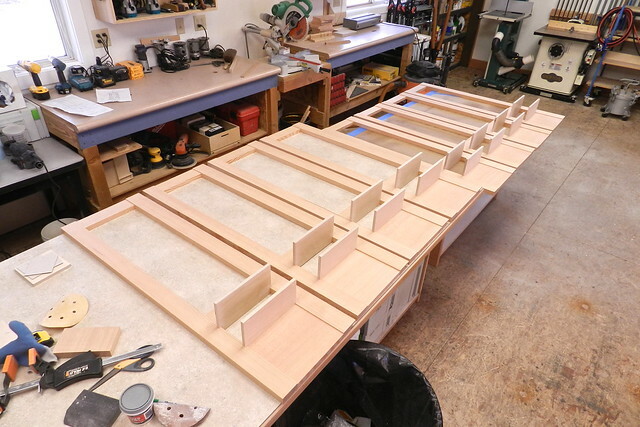 It looks like a simple assembly of squares and rectangle assembled to create a side then the sides are assembled to create the body of the chandelier. It is actually a very technical assembly that has to be very straight and square. The fins have to come off square from the lantern and the legs have to hang straight in line off the bottom or the deviations will show and it will not work. Besides that, this chandelier design contains something like a bajillion pieces and you have to make most all of them. 2 other LumberJock members are showing at the same exhibition; Andy Chidwick and Scott Morrison. Here I am at the show with Andy Chidwick and his musical chair. Beautiful work. Hope you do well at show. Todd that is a great chandelier very impressive. The precision shows as well as the fine finish. That´s beautiful. What kind of lamps are you using, do you have a detail pic of electrical assy inside? Is it easy to change lamps? Wow Todd! 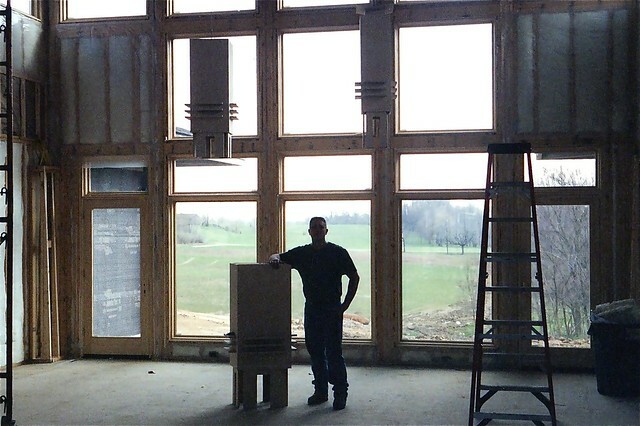 That is an impressive piece of work – typical of the craftsmanship that comes out of your shop. Very nice work, and thanks for the detailed explanation! That’s just great, Todd. I wish I could see the whole show. And yeah, that is a bajillion pieces to put together, correctly yet. By the way, Todd, I’m in Buena Vista Colorado today visiting Steel Strike Furniture. Check them out on their website and I think you will see why I’m here. Good luck and best to all in Billings. A work of art! You really get a sense of the size in the pic with y’all standing beside it. Once finished, what does it weigh? This. Angle! Good to hear from you! I will be sure to get over to their site and check them out. Jaykaypur – I am not sure exactly but maybe 65-70 lbs. A stunning piece! Congrats on keeping an eye out for inspiration in unexpected places. The shape actually works better as a chandelier! Your skills are incomparable. ! Surfside – that is a pretty big compliment. There are guys, a few of them at the same exhibition, that I am still chasing and will probably never catch up to. An impressive piece Todd,fantastic work. beautiful todd, that had to be some fun doing this piece, its a stunning lamp..
Great job, I love the details in the finished product. You have really captured the prarie style! I pretty sure Todd that your piece will outshine in the museum exhibition .